Let me answer my rhetorical question immediately: obviously not, there are so many art forms out there today that trying to single out one of them is clearly ridiculous. So let me rephrase: Is the Jazz Piano Trio my ideal art form? And the answer is, pretty close. There is something special about the intimacy of 3 musicians together, interacting and generating something amazing. It is in a way the modern equivalent of the String Quartet, which many consider the summit of classical chamber music. I’d like to start by one album which I consider somehow the birth of the contemporary (meaning the last 30 years, I’m starting to get older…. 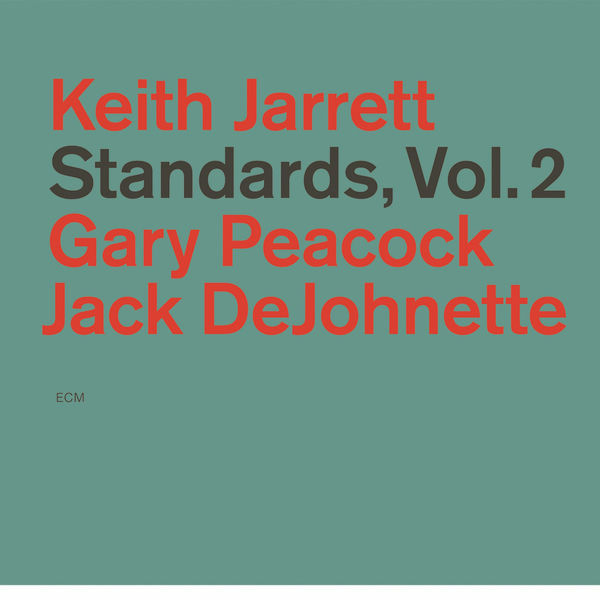 ): Keith Jarrett’s Standards vol. 2 (footnote: vol. 1 is great as well, I just have a very slight preference for the 2nd volume). Oh no, you’re going to say, not Jarrett again. Well first of all, you’ve been warned, it is in my subtitle of the blog, and second, I promise I’ll be talking about other musicians as well in the future. Back to my old friend Keith (not that I’ve ever met him beyond being about 25 meters away last Friday): Why is this album so important? Well, put yourself in the early 1980s (assuming you were already alive then, I was, but not for long). Jazz just came out of an entire decade of trying to break the “limits” of traditional jazz by first going “Free”, and later by going to Jazzrock and Fusion. Well, I’m sure to offend some here, but to me this was a complete dead-end, and both genres bore me to death (slightly exaggerating to make a point here). As important as the 70s were for genres like Rock, for Jazz it is my personal lost decade. Most of my collection goes from 1956/7 – 1966, and then starts again in the 80s. So in the early 1980s, we have Keith Jarrett, who already did the amazing solo concerts in the 1970s including the famous Köln concert, apparently the best-selling solo piano album of all times, and had been playing some quartet work both in the US and in Europe (I’ll talk about some of my favorite albums from that period later, so it wasn’t 100% a lost decade, just maybe 90%….). So then, early 1980s, the bass player Gary Peacock, the drummer Jack de Johnette, and Keith, get together to record first Standards vol. 1, in 1983, and then vol. 2, in 1985. Both are obviously inspired from the key representatives of the traditional piano trio, e.g. Bill Evans first trio, Art Tatum, or Oscar Peterson, but represent something new. And obviously, luckily, don’t contain any element of fusion any more. I’m not going to review Standards vol. 2 in detail, many smarter people than me have done that. It is an album I keep going back to again and again. I’ve actually just purchased it again very recently. ECM just released some weeks ago a new remaster, now in high-res format of up to 24/192 (bit/khz respectively). Whether high-res files are better than the regular CD format (called 16/44 or “red book”) is a debate I’m certainly not going to start here, you’ll have enough sites to get that discussion going. What is really better is the remastering. ECM; Jarrett’s Munich based record label is known for the excellent recordings, and this new remaster really sounds way better than the CD version. I actually still have the original vinyl in my basement, maybe I should actually get a record player again at some point. (Footnote again: Do I advocate everybody to get the high res version? It is quite pricey, ECM has always been a premium label. So only get it if you have a decent playback chain and care enough about that album). So to me, Standards vol. 2 is the “standard” (sorry for the cheap pun) to which I compare all my piano trio recordings. Luckily, today we’re living in the Golden Age of the piano trio, we have so many fantastic artists out there that we’re not limited to Keith Jarrett any more. But we really have to thank him for revitalizing this genre (EST then took it to the next level in the 90s, but more about that later). UPDATE (Oct 2016): I’ve since reviewed many more Jazz piano trio albums, you can check them all out by clicking on this link. And please let me know if you have any recommendations for me in the comments section below! Well, the subtitle of my blog is “From Jarrett to Brahms”, so I after writing about the former I may as well write about the latter. Brahms will always have a special place in my heart, not only he was born in my favorite city in the world (no, not NYC; although that comes close), but his music combines the best of what the so-called “classical” music (which spans several centuries of written music): He has the greatness of Beethoven (his idol), the romanticism of a Schumann (his mentor), the structure of Bach (Brahms studied Counterpoint extensively), he comes from my favorite instrument (the piano), and no matter what piece you hear from him, it has something very uniquely “Brahmsian” about it. Smarter minds than me have tried to define what that actually consists of, I won’t even try. I’m pretty sure listening to several of Brahms works (for a start, how about Symphony 1, the German requiem, some of his late piano pieces op. 116-119, and some chamber music, e.g. his piano quartet op. 25), and I hope you feel and hear the commonality. The first oeuvre from Brahms that impressed me was his first piano concerto, in a decent but not outstanding recording with Solti and Andras Schiff. I still very much like this, but will write on it later on. I very quickly started diving into his symphonies, and no. 1 quickly became my favorite (these days, 4 comes very close in my personal preference, 3 is a bit behind, and 2 is nice to have). By today, I’ve collected at latest count 30 version of “Sinfonie Nr. 1 c-moll op. 68”, to give it its official title. My first early favorite was Otto Klemperer’s version on EMI. Not to far after that, I discovered the legendary Wilhelm Furtwängler, and all 3 versions I have from him are very very good. How do I compare versions of this work? Well, usually I’d use a more differentiated approach, but on symphony 1 I’m simple-minded: the chromatic opening part, with the characteristic tympani. If this part doesn’t have the right gravitas and tension (up to a point where I feel all my muscles tensing), I pass on. An example of how not to do it in my mind is Günter Wand (an underrated conductor that I otherwise adore, especially on Bruckner), which takes the opening WAY to fast. Luckily, Furtwängler keeps the quailty at very high levels up to the end. In this symphony, the first and forth movement are so heavy and important, that the two movements in between barely count. You get a “relaxing” Andante, and a very short and sweet (approx 5 min) Poco Allegretto in between. This is good, because if one had to keep the tension and the overwhelming feelings from movements 1 and 4 for an entire 5 min, you’d probably feel like being on Botox and Extasy at the same time. So, as said before, movement 1 lives on the dramatic chromatic opening. But it gets even better: movement no. 4 is as ecstatic as the 4th movement of Beethoven’s 9th (without all over sudden somebody shouting “Oh Froyda” and all the other singing about freedom and equality that goes on after that which pretty much ruins this symphony to me). But you don’t get there easily. This movement with Furtwängler alone is more than 17, and you start very dark and desperate. Luckily we leave the desperation quickly, to a dramatic built up including the mandatory tympani, which gets us to the first amazingly beautiful horn solo at 2:57. “Hoch auf´m Berg, tief im Tal grüß ich dich viel tausend mal!” (High on the mountain, deep in the valley, I salute you a thousand times). Yes, cheesy, even in the German original, but by then Brahms had moved from his native Hamburg to Austria, and fallen in love with the mountains, and you can really picture a lonely Alphorn playing that beautiful melody for the beloved. But obviously at, 2:57 we’re not done yet, you 14 min more of “per aspera at astra” (you can google that yourself) fighting, with the occasional relaxing 2nd main motive, which Brahms even admitted was inspired by Beethoven 9. (When asked after the premiere if there are strange similarities between the two works, he replied sarcastically “And even stranger is the fact that every donkey seems to hear that immediately”. Well in any case, in the last 5 min you get a lot of more brass, some more of the 2nd motive, some more of the Alphorn, tons of tympani some more fighting, which culminates in a dramatic climax in the last 2 min. Obviously, my description of this amazing masterpiece is quite horrible. Don’t be misled: if you’re able to listen to this movement played by Furtwängler without getting goosebumps all over, you’re either deaf or challenged in some other way (or just have a different taste in music, but then you probably wouldn’t be reading this in the first place). P.S. I’ve later published an addendum to this post here.